A former Africa editor for The Economist, Robert Guest addresses the troubled continent's thorniest problems: war, AIDS, and above all, poverty. Newly updated with a preface that considers political and economic developments of the past six years, The Shackled Continentis engrossing, highly readable, and as entertaining as it is tragic. “Rarely does an author combine experience, common sense and humour when writing about Africa. It's even rarer when the analysis is as hard-hitting as in the writing of Robert Guest.” Roger Bate, Wall Street Journal. “I doubt whether there is a better brief introduction to the travails of modern Africa and their causes.” Anthony Daniels, Sunday Telegraph. “astute and clever…[Guest has] an extremely strong and rationalist grasp of the present, and travels with the classical economists David Ricardo and Adam Smith as inspiration. 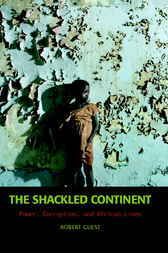 The Shackled Continent is a lively and provocative read.” RW Johnson, Sunday Times. “[Guest] is a lively and observant reporter. He portrays, with humour and some compassion, how nothing really works in most African countries. The reader can learn much from this lively and outspoken book.” Anthony Sampson, The Guardian. “Anyone who wants to be reminded of the horrors of Africa, economic or otherwise, will be interested to read this intelligent but light treatise.” Christopher Ondaatje, Literary Review. Jeremy Gordin, The Star, South Africa. “This is the kind of book you read holding your nose. Even H.M. Stanley, the British journalist/explorer who lived fat on the weird stories about Africa he published in his journals, [would have been] ashamed of some of the views expressed by Guest.” Osei Boateng, New African. “This is the book for those who despair for Africa, but even more, it is the book for those who despise Africa. [Guest's writing reveals] his journalist's determination to unravel Africa's complicated, seemingly intractable problems and his economists' determination to rectify them. . . . You can't know how cynical and complacent you've become about the world's problems until you take this journey with Robert Guest.”—Debra Dickerson, author of The End of Blackness: Returning the Souls of Black Folk to their Rightful Owners.